Come join us in Fort Worth, Texas on 21-22 September for the Pointwise User Group Meeting 2016. The call for papers is open (due date is 01 July) – this is your opportunity to share your CFD work and the Pointwise meshes you used. CFMS will participate in the UK’s Hyperflux++ project which aims to create the next generation of CFD tools using high order methods. CONSELF Cloud CFD v2.0 was released with new features such as vertical apps, cut cell hex meshing, and improved BC setup. CONSELF also explains common CFD terms. ENGINEERING.com writes about improvements to the Cartesian meshing in FloEFD v15. DEVELOP3D calls ANSYS “a simulation legend” in this article about Workbench R17. FEATool 1.4 (FEA toolbox for MATLAB) was released with major changes across the entire application. 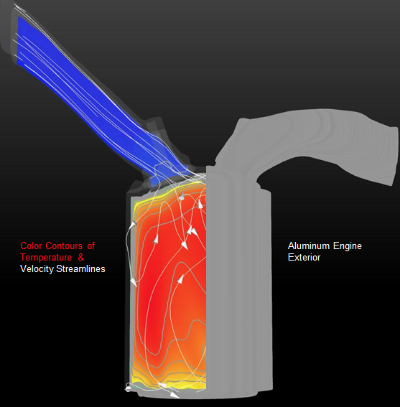 This EnSight visualization of a CONVERGE model won Aimilios Sofianopoulus the cover of Stony Brook University Institute of Advanced Computational Science Annual Magazine. Image from CEI. Sorry, no URL. When modeling propellers in CAESES, there are handy tools for comparing blade sections. Speaking of marine hulls and propellers, HydroComp‘s software has new representation in China and Japan. Red Bull Formula 1 will continue to use ANSYS to simulate the aerodynamic performance of their cars (see image below). ANSYS CFD simulation of a Red Bull Formula 1 car. Image from InsideHPC.com. See link above. CD-adapco’s Steve MacDonald has been posthumously inducted into the Long Island Technology Hall of Fame. Syracuse University seeks a department chair for Mechanical and Aerospace Engineering. ERCOFTAC presents CFD for Dispersed Multiphase Flows V, 13-14 June 2016, in Oslo, Norway. Amtec seeks a Fluid-Thermal-CFD engineer in San Jose, CA. If you missed the 2016 Stanford HPC Conference you can catch-up on exascale, the cloud, and more in their video gallery (including presentations from Rescale and UberCloud). Vulkan 1.0 is a “new generation graphics and compute API” for use with GPUs. A European consortium is working on ARM-based exascale computing. And Inside HPC also writes about some of the specific challenges of bringing HPC into the cloud. Red Painting (see below) may be my favorite of Mark Bradford’s works and not just because of its mesh-like appearance. However, just like meshing there are aspects of both order and chaos, process and automatism, surface and depth. Mark Bradford, Red Painting, 2009. Click image for source. This entry was posted in Applications, Events, Hardware, News, People & Places, Software and tagged ANSYS, CAESES, CD-adapco, ConSelf, CONVERGE CFD, EnSight, FEATool, FloEFD, HydroComp, Hyperflux, jobs, meshing, Pointwise, Pointwise User Group Meeting, Rescale, UberCloud, Vulkan, Workbench. Bookmark the permalink.